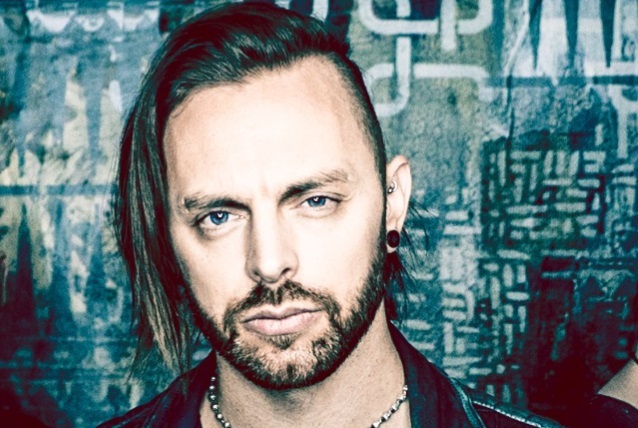 During a recent appearance on Full Metal Jackie's nationally syndicated radio show, BULLET FOR MY VALENTINE frontman Matt Tuck spoke about the band's decision to add more electronic elements to its distinct signature sound on the group's latest full-length release, "Gravity". "Well, this is album number six," he said (hear audio below). "We've been around a long time now; we've had five previous records. And we've kind of stuck to a certain way of writing, a certain sound and formula for many years now, and we just felt that the time was right to add different colors, sounds and elements and diversity to our sound and our songwriting abilities. It was just something that we've never really done in the past; we've dabbled on it slightly on a couple songs on 'Venom'. So we knew that, if done right, it's a very powerful way of enhancing the feel of a song, just like movie soundtrack stuff." "Gravity" was issued through BULLET FOR MY VALENTINE's new label home, Search And Destroy, the imprint launched in 2014 by Spinefarm and international artist management company Raw Power Management. BULLET FOR MY VALENTINE will be joined by WE CAME AS ROMANS and BAD OMENS on this fall's U.S. tour, which runs from September 13 through October 16. The band will also appear at two premiere fall festivals — Riot Fest in September in Chicago and Aftershock in October in Sacramento.